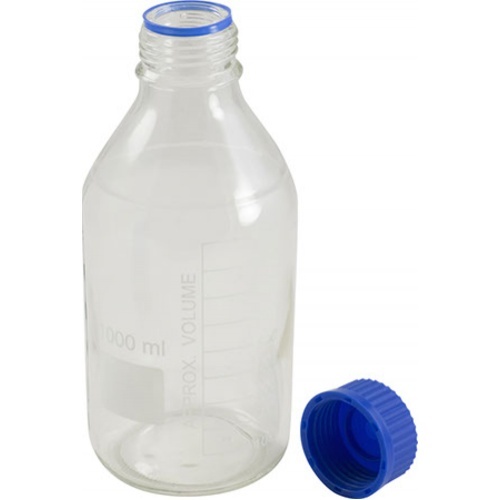 This is a super cool bottle for making yeast starter wort. Mix DME and water to make your wort and then boil in the microwave with the cap off. Remove from microwave, thread on the cap while still hot, and place in refrigerator. Store the wort till you need it. When you are ready to make a starter remove from refrigerator to warm up, pour into a sanitized flask, and add your yeast. Make multiple bottles all at once at store in your refrigerator until needed. 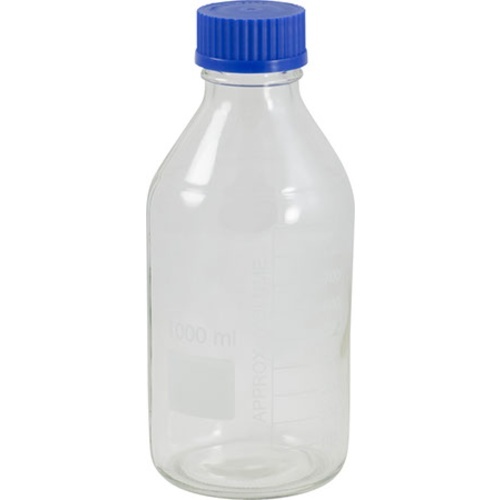 This reagent bottle is made from durable borosilicate perfect for storing anything you need. Borosilicate is great because unlike ordinary glass it won't crack with rapid changes in temperature. Always looking for inovative ways to save time and money. Every now and then I do a yeast starter, and using this reagent bottle helps to make a starter when time permits, and use it when a starter becomes necessary. good friend recommended kick starting yeast. Have been looking for an easier way to make starters since Fast Pitch went away. Good quality glass, and a great bottle overall, but had trouble using it with my magnetic stirrer because of the slightly convex bottom. These are about 9" tall and won't fit in a smaller microwave. It's pretty easy to induce a wort volcano, so until you know how things work for the microwave you have I'd advise a foam reducer and/or short bursts of cook time while you watch it like a hawk. Not as convenient as I had hoped, but still easier than boil then chill the day before brew day. Perfect. Just remember your chemistry classes. Don’t take out of autoclave and rinse off the mess. They implode! Not a product flaw, just science. Filled with potato dextrose agar. Just warm in a bath and pour your plates or slants. I have been looking for an easy way to make starter wort in advance to simplify the process. I looked into using canning jars, but that required a pressure cooker and related canning equipment that I don't have. I thought about using canning jars without a pressure cooker, but was too concerned about a possible infection. While it was available, I used the FastPitch canned wort which was great, but it is no longer available. Then I discovered these bottles and thought I would give them a try.. I bought two for starters (pun intended) and made my first batch: mix DME with water in measuring cup, pour into bottle, add fermacap to prevent boil over, place in microwave for 6-7 minutes until it boiled, remove from microwave (use oven mitts), cap and place in refrigerator. Voila, ready to use starter wort. When it was time to make a starter, I just removed the bottle from the refrigerator and let it warm up to room temperature before using. 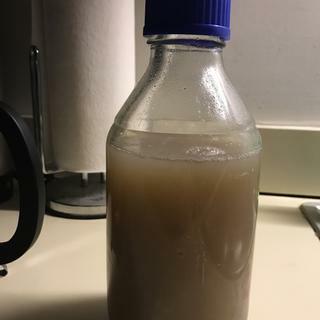 I made starter wort with my two bottles a number of times without any problems or infections. However, a few weeks ago, I was making a new starter wort when the bottle exploded after I put the cap on. I had microwaved the starter wort as usual, however, this time, I had a slight boil over in the microwave. I removed the bottle from the microwave, put it in the kitchen sink, put the cap on and then ran some water over the outside of the bottle to rinse of the boil over wort. BOOM! The bottle shattered into 6-8 large pieces. I know it was probably foolish to rinse the hot bottle off with tap water, but I expected it to be able to withstand the temperature change. Live and learn. Despite the explosion, I ended up buying 2 more bottles and just finished filling them with starter wort without any problems. The convenience is worth the risk in my opinion. However, I will never run tap water over a boiling hot bottle again, even if it is borosilicate. I really like being able to make a large batch of starter wort in advance. I have purchased two and used them both twice with excellent success. I plan on purchasing at least two more. The only con I have is the thin blue top gasket comes off during cleaning. It is a little hard to get back on and there isn't any replacements available yet. I know I'm going to loose one or break it.